Evidence-based research and decision making are increasingly in demand in professional practice. Bringing Evidence into Everyday Practice: Practical Strategies for Healthcare Professionals is a unique workbook that offers students and professionals efficient strategies for translating evidence into everyday practices. Dr. Winnie Dunn has designed Bringing Evidence into Everyday Practice to be used as a step-by-step resource for students and professionals on how to understand and use evidence available in research and how to build solid decision-making patterns that will support professional practice. With a vast amount of resources available today, it is critical for both the novice and experienced practitioner to use effective tactics. By following the specific steps inside Bringing Evidence into Everyday Practice , a student, professional, interdisciplinary team, or study group can learn how to derive meaning from research articles in a more efficient way and then use the information to make informed decisions in everyday practice. Written in a user-friendly format, this text provides over twenty research articles and numerous worksheets so readers can practice interpreting research as they are learning. Bringing Evidence into Everyday Practice: Practical Strategies for Healthcare Professionals is the only text that can both act as a companion workbook to literature and also encompass volumes of research within one text. Article 16 Caregiving and Autism: How Does Children’s Propensity for Routinization Influence Participation in Family Activities? "Personnel in professional practice now recognize the importance of making decisions with an evidence-based foundation. This new book should be in the hands of therapists and students who are concerned with research, patient care, and how to integrate evidence-based studies in their approach to patients." "This clear, organized, easy to follow guide lays the foundation for a systematic approach. This book is well written, informative, and follows a logical sequence. The practical strategies will be very useful to students to understand and implement evidence in their practice areas. I would highly recommend it not only to occupational therapy students but also to evidence based practitioners and health care policy consultants." 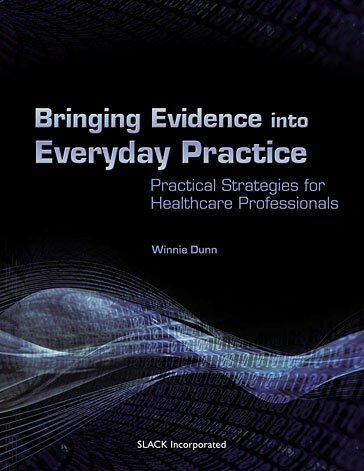 "The book Bringing Evidence into Everyday Practice: Practical Strategies for Healthcare Professionals by Winnie Dunn, PhD, OTR, FAOTA, is an excellent reference on using evidence-based research in clinical practice. This book can assist in the mastery of evidence-based practice skills and facilitate the practitioner’s ability to integrate these skills into real-life situations." Winnie Dunn, PhD, OTR, FAOTA, is Professor and Chair of the Department of Occupational Therapy Education at the University of Kansas. She was the Eleanor Clarke Slagle lecturer in 2001, received the Award of Merit from the American Occupational Therapy Association, received the A. Jean Ayres research award and the Chancellor’s teaching and research awards, served as a Kemper Teaching Fellow, and is a member of the Academy of Research of the American Occupational Therapy Foundation. She has contributed research and other writings to professional literature across her career. Currently she is involved in a statewide initiative called KANSAS: From Evidence to Practice ; their purpose is to embed evidence-based practices into all the early intervention and school networks across the state. Her latest endeavor to translate research into practice involves the publication of a book for the public entitled Living Sensationally: Understanding Your Senses . Its focus is to translate her research about sensory processing into everyday language, so that everyone can understand their own, their family’s, their coworkers’, and their friends’ behaviors a little better. Instructors: Visit our new website especially for you at efacultylounge.com! Through this website you will be able to access a variety of materials including, Bringing Evidence Into Everyday Practice: Practical Strategies for Healthcare Professionals , Instructor’s Manual. Available on-line, this exciting manual provides up-to-date ideas and resources for the classroom.